1973-A Santiago, Chile. 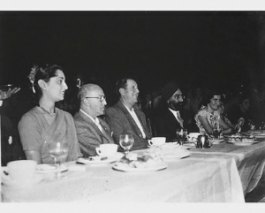 Dinner for President Allende at the Indian Embassy in Santiago. 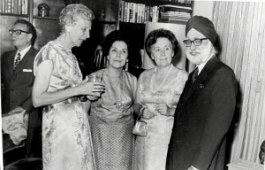 From left to right President Allende, Milena Luksic de Marin, Hortensia Busi de Allende, wife of Chief of Army Staff, author. 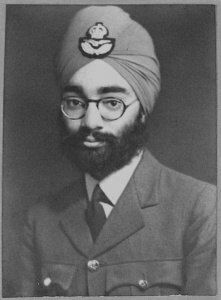 1944 London, In R.A.F. uniform. 1971 Lima, Peru. Presentation of credentials to President of Peru in the presence of the Foreign Minister and Aides-de-Camp. 1955 Buenos Aires, Argentina, at a display of Indian fashions organized in co-operation with the Union. 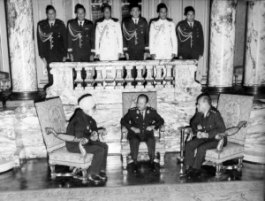 Left to right - Kirat, an unidentified Argentine, President Juan Domingo Peron, author and the President of Secondary Students Union, .